Scarpa says:"The Men's Trek GTX Boot from Scarpa is a hiking and trekking boot that will keep your feet protected and secure through long walks over tricky terrain whether you are carrying a pack or not. The ergonomic last of the boot has been created for those with low foot volume and slimmer heel in mind to help ensure everyone has a comfortable walking boot option that fits well. The durable leather upper combined with the Gore-Tex lining offers excellent waterproof protection as well as breathability to ensure a healthy environment for your foot. A durable protective toe rand around the edge of the boot helps protect against the inevitable scuffs and scrapes along the way to keep them in tip-top condition for longer." I was fortunate enough to test the Trek GTX Boot from Scarpa during a summer trip to the Austrian Alps. This was an ideal environment since it involved trekking across rocky terrain complete with a heavy back pack as well as using them with crampons to tackle both wet and dry glaciers. First impressions were good. These are a pair of no frills, brown, leather walking boots. There are no fashion colours to choose from, no clever stitching patterns, no little gimmicky features. 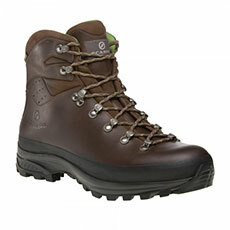 Just a good traditional pair of classic walking boots designed and built for walking in the mountains and hills. I already loved them. Scarpa say they are designed specifically for walkers with low foot volume and slimmer heel. I don't think I have a particularly low volume feet or slimmer than usual heels but I have to say I did find the Scarpa Trek GTX Walking Boots to be incredibly comfortable straight from the box. After 8 days trekking around the Austrian Mountains they were still wonderfully comfortable and my feet were still in great shape (unlike the rest of me!). My feet were well protected from the all the features you would expect in a quality walking boot. A thick and durable rand goes all the way round the base of the boot. The lacing is nice and secure, with plenty of scope for adjustment. The ankle support and the tongue have plenty of cushioning and the Gore-tex® lining did an excellent job keeping the water out whilst allowing my feet to breathe. The Vibram Biometric Fly sole is nice and thick and provided sureness of foot on even the most rugged of terrains, from loose rock to wet stone. The Scarpa Trek GTX Walking Boot takes a crampon with ease (I used Grivel G10 Classics) which means this is an ideal walking boot for trekking and hiking the whole year round. I love the Trek GTX Boot from Scarpa. They are comfortable, waterproof, unfussy and just do the job they are designed to do really well. They may not suit people with wider feet or higher volume feet but you should at least try a pair on and see how the fit. I did find after a week or so that the leather upper and the rand were showing signs of having been out in the hills and mountains - but no matter, I have always preferred my boots to have that 'experienced mountain walker' look anyway.